Running under Dunlop Ave is a 54’ water main on the right side of Deer Valley WTP. The only access to the pipe is down a manhole in the middle of Dunlop Ave, through a 24’ pipe and then back down the water main 400 feet. This made it very difficult to remove the failed coal tar epoxy coating and then abrasive blast the pipe to remove all the rusted portions to provide a clean surface profile for the application of the AquataPoxy A-6. The steel pipe was blasted to a SP10 and then inspected for correct surface profile and cleanliness. The new coating was selected by Greg Merzchowski at HDR based on his personal experience with the product and for its ability to be hand applied, then returned to service after only 72 hours of curing. AquataPoxy A-6 is a 100% solids epoxy that is NSF/ANSI 61 certified for use in potable water pipe and tanks and has been being used for more than 35 years to provide corrosion protection on both steel and concrete structures. The AquataPoxy A-6 was hand applied with low nap rollers in 2 to 3 coats. Once cured, the entire coated area was holiday inspected to locate any pinholes or thin spots in the coating film. 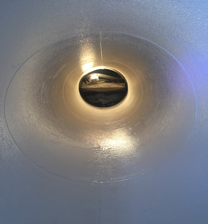 Also, coating film thickness readings were taken throughout the pipe to make sure the coating met the minimum requirements that had been specified. All the spots found to be deficient were abraded, cleaned and then repaired using A-6. The entire project, from start to finish, took only 7-8 days to complete, test, repair and then return to service.